The white paper sets the stage for many hundreds of millions of dollars a year in programming for very young children from 6 weeks to 5 years old. It broadly describes DOE’s proposed plans for everything from Pre-K and 3-K to Head Start to subsidized child care offered out of private homes. DOE is soliciting comments on this document, which will inform the next round of contracts for programs to begin in 2020. At the Center for New York City Affairs, our first take is that there’s a lot to appreciate in this vision. It’s DOE’s start towards articulating an overall approach to a unified early childhood education system, one that values quality, racial and socio-economic integration, and that recognizes many working families need 8-10 hours a day of child care year-round. It also acknowledges the need for increased attention to children with special needs. The City-contracted child care system has shrunk in recent years, so many will find it reassuring that the DOE commits to maintaining the capacity for serving infants and toddlers, with the hopes of ultimately expanding it. There are, however, a lot of open questions about realizing the vision the white paper presents. The biggest question is whether programs will be staffed and resourced well enough to provide high quality care. This has the potential to simplify an enrollment process now burdensome for both parents and providers. In DOE’s new vision, child care programs will no longer be expected to offer the full menu of supports found in Head Start programs. Head Start is widely recognized as a quality model because it provides families living in poverty with access to extensive family support services. However, Head Start programs often do not provide the 8-10 hours of care that many working families need. Federally-funded child care programs for low-income working parents, on the other hand, typically offer the 8-10 hour day, but not the supports of Head Start. The City’s contracted child care system, called EarlyLearn, sought to combine the best of both models—wrap-around services and full-day care. But while this vision was widely applauded, the funding allotted often proved insufficient, and some of the requirements came to be regarded as burdensome, unfunded mandates. The DOE proposal separates these two models and anticipates separate competitions for interested providers. It says that child care programs will continue to have “robust family engagement and social-emotional supports," but does not yet define what those will look like. Head Start programs will continue to offer the 8-10 hour day that working families need, and will support this with City Tax Levy funding. 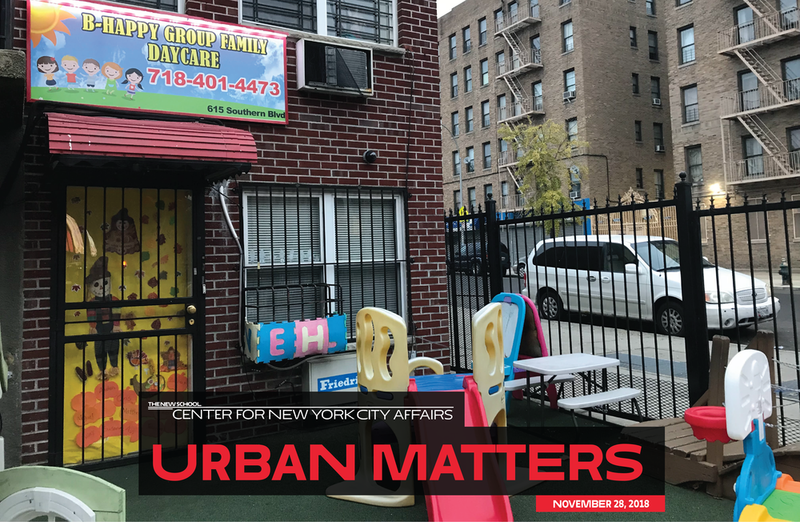 Under EarlyLearn, City-contracted family daycares, which operate out of private homes, are earmarked for babies and toddlers, who then transition at age 3 to more-resourced child care centers, where ideally they will be taught by certified teachers. DOE is proposing to allow the small, home-based programs to retain 3-year-olds enrolled in them through EarlyLearn and to also become 3K providers. What education background the DOE will require of family child care 3K teachers, and whether they will be paid comparably to 3K teachers in public schools and child care centers—two things that could have a big impact on class quality—remains to be seen. DOE plans to continue the City’s practice of contracting with family child care “network” organizations to support and monitor the home-based programs, a practice which research has linked to higher-quality programs. In an important recognition of the specialization involved in family child care, DOE will no longer require network organizations to be connected to child care centers. Universal Pre-K and 3-K programs in all settings end in mid-afternoon, when the school day does. Families who want aftercare must pay for it. Under the new plan, child care centers and family daycares with Pre-K or 3-K programs can offer subsidized, extended hours to income-eligible families. This will provide a full day of care for working families and consistency of care for kids. DOE commits to encouraging racial and socio-economic integration—a crucial goal in a city which has highly segregated public schools, and where universal Pre-K classrooms are even more segregated than kindergarten. Offering subsidized aftercare in universal programs may help with this. However, other proposed plans have the danger of creating more, not less, economic segregation. For instance, separating Head Start from other programs means that children living in poverty will be separated from the children of slightly-higher income, working families. Child care directors tell us that even this slight income difference can mean a lot. Currently, a teacher makes considerably less while working longer hours in a Pre-K or 3K program in a subsidized child care center than a similarly credentialed and experienced early education teacher in a public school. This has led to a drain of talented, experienced teachers out of the subsidized child care centers low-income families depend on. DOE must make a plan for creating pay parity. These plans are open for comment for 30 days and may be revised before the Department of Education releases a series of requests for proposals. It's an opportunity to ask these and other questions that can help the City flesh out its vision.